“We are proud to offer our 2015 Christmas Cheer pipe tobacco, an exceptionally fine vintage tobacco, hand blended and aged in pressed cakes to develop natural mellowness. This 2015 blend is made with a special selection of rich, ripe, flue-cured Virginia from an outstanding 2011 Old-Belt crop. Superb leaf picked at peak ripeness, it is naturally sweet, rich in oils. It should age with distinction. Each buying season, we look for tobaccos of exceptionally quality and distinctive character. In various combinations, their flavors, aromas, textures contribute to the overall excellence of all our products. “The leaves of different crops and regions are combined to maintain consistency from year to year. “With Christmas Cheer pipe tobacco, we treat our discriminating customers to the singular pleasure of a tasting of the very finest in tobaccos of a particular vintage, not worrying about maintaining the flavor and appearance of this product into future years but actually striving instead to present the unique character of a single crop and area. 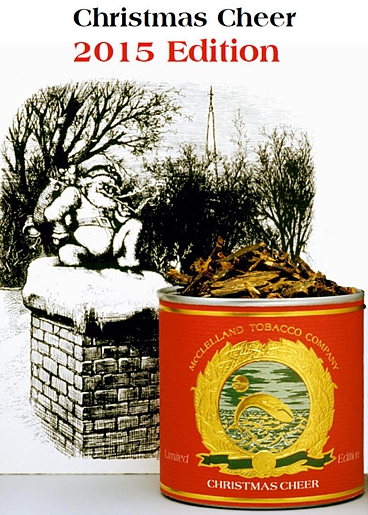 The McClelland Christmas line of pipe tobacco is probably one of the best, most famous lines of tobacco produced in America. Every year McClelland has embodied everything Christmas is about in one simple mouthful of tobacco smoke. In the end, I believe the best way to describe this blend is to hand it the microphone. Everything in this tobacco translates crystal clear. I strongly suggest you read this blog, and immediately fill up your favorite with a bowl of rubbed Christmas Cheer, and prepare to have your world fulfilled. This year, the Christmas Cheer comes in a 100g tin. The tobacco has been pressed into a luscious cake, and then cut fairly rugged. The tobacco seems to have a nice moisture level, but probably wouldn’t be disturbed if allowed to dry out a little. I suggest rubbing this flake out, for it is just way to thick to smoked folded. As soon as the tin is popped, the slightly fermented smell of red Virginia’s instantly permeate your olfactory system in the most pleasant way. There is just enough sugar in this specific harvest of tobacco to initiate fermentation (this is great because there is no need to add any Perique, which would drastically change the flavor). The other scents I was able to pick up on were just some random hints of hay, a Virginia staple. In order to make this tobacco consistent, McClelland bought a certain line of belt crop Virginia in 2011. For the tobacco to begin aging properly, it was fire cured at the time of ripeness, which ensure more sweetness in the leaf than average. After allowing it to age about four years, it has finally been handled and formed into a proper blend. So let me get the negatives out of the way: Because the flake was so thick, the Virginia was hard to break up and had to be loaded in my pipe into chunks, making it difficult to light. But this wasn’t really a big deal. The only other issue I had was that it tended to burn a little hot. Not so much on my palate as in my bowl. At the end of a large bowl, it began to feel like I was holding lit charcoal. But if I were being honest, these are not big issues, Many blends have these problems and we just don’t notice them many times. The flavor of this blend was just on another level; crystal clear! At first light, it is really apparent how sweet the tobacco is. The more you smoke it, the more you begin to realize that it has been fire cured. The deeper you go still, the flavor grows stronger and you begin to feel more nicotine hitting you. All in all, this flavor is like a black hole. The deeper you go in, the stronger the forces are that cause you to love it. Another part of this tobacco that I appreciate is the smoke ribbon itself. While it is not a light smoking blend, the texture and density of the smoke is very petite. Even so, it still gave me billowing clouds of smoke. I happened to appreciate this, as I am sure you will. The room note here was mildly pleasant. When you smell the notes in the tin, you can kind of predict that the room note won’t be bad, but it won’t exactly be delicious either. And you would be right in assuming so. Honestly, I wasn’t able to tell what the smell was of, it just reminded me of a basic pipe tobacco smoke. Not good or bad. As this is a holiday blend, in the sense of the Christmas spirit, it is obviously best enjoyed with whatever tradition you are proud of around that time. But flavor wise, this blend seemed to go really well with a glass of Merlot. The slightly sweet wine was a nice partner for the sweet and smokey flavors of the tobacco. The bodies of the two seemed to match (which is the most important aspect of pairing). And for the record, in my opinion, red wine seems to always go well with red Virginia tobacco. This tobacco is a Medium blend. When you light up, you are tricked into thinking that the tobacco will be fairly mild. But as I mentioned above, the flavor gets deeper and deeper, rendering this tobacco a medium. I should also note that I tended to be susceptible to the nicotine in this blend. I realize that I smoked it in the morning, but I would have to say that there is a decent nicotine level here. Even though I smoked this blend fresh, let’s get one thing straight: this blend needs to be aged. Not because it isn’t good right now, it is downright delicious! But because in 5-10 years, the flavors presented here are going to be absolutely amazing. Everything, from the tobacco, to the curing process lends this blend to being aged for at least five years. I give McClelland Christmas Cheer 2015 an 8 out of 10. This blend was a true pleasure. From the flavor, to the long smoking time; from the inspiration, to the packaging, this blend is legendary. Order a tin for now and a few tins for later, and you will see what I mean. Pictures provided by McClelland, Smoking Pipes, and TobaccoPipes.com.